The Rowley Hills are an iconic Black Country landscape with an important scientific, industrial and social history, owing mainly to their varied geology. The Rowley Rag is thought to have been used by people as far back as Roman times, when it’s likely to have been used as roadstone on the Portway Hill, which follows the line of an old Roman Road. Quarrying on an industrial scale began around 200 years ago, and thirty separately named quarries of varying ages have been identified. These provided employment for generations of local people from the surrounding communities. The last active quarry closed in 2008. 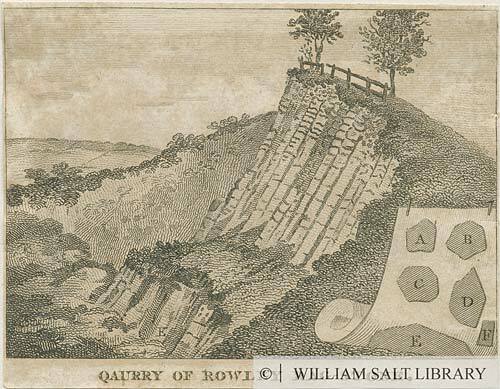 Quarry of Rowley Ragstone, c. 1760 – 1799, from ‘The Gentleman’s Magazine’. Rag is an abbreviation of ragstone, which means a rock that forms ragged sharp angles. As such, it was generally not suitable as a building stone, and its main use in more recent times was as crushed aggregate in road-building. However historically rough blocks were used in walls locally, e.g. at St Giles Church, Rowley, and it was also used to build drystone walls which served as field boundaries on the hills. Other uses included kerbstones, gutters and setts; also cobblestones in the early 19th century, although this was not to last long due to the rock’s tendency to become polished with wear, meaning that horses could easily slip and fall. The most unusual application for Rowley Rag was the manufacture of a wide range of goods by melting the rock and casting it into moulds. Although the items produced were very durable, production costs were uneconomic, so this venture was short-lived. 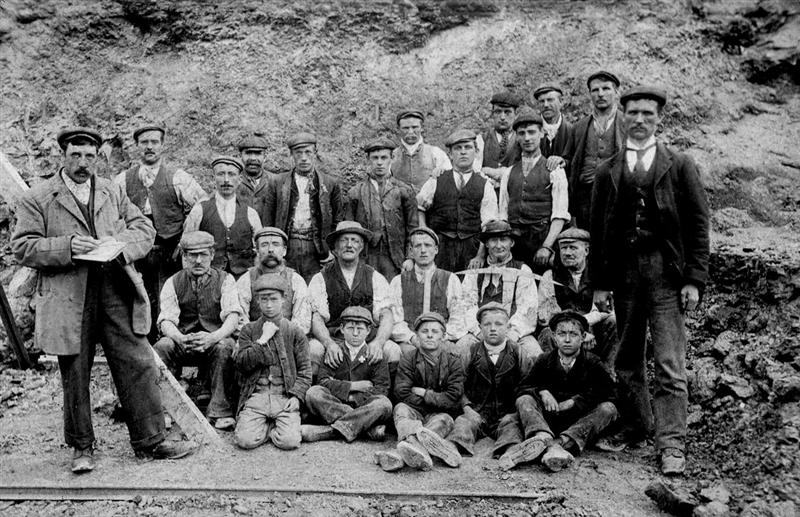 ‘After Luncheon came the crowning event of the day – the descent by more than 400 persons, including many ladies, of the famous Lye Cross Coal Pit at Rowley, which was superintended by Mr. Latham. This pit is remarkable as the first sunk through the Bassalt, or Rowley Rag. Where the pit was commenced the thickness of the basalt was unknown; it proved to be no more than 68 yards, when the rock binds of the coal measures were reached. At 168 yards the Two-foot and Brooch coals were met with, and at 228 yards the Thick coal was cut into. The pit is 258½ yards deep.’ (Anon.,1878). 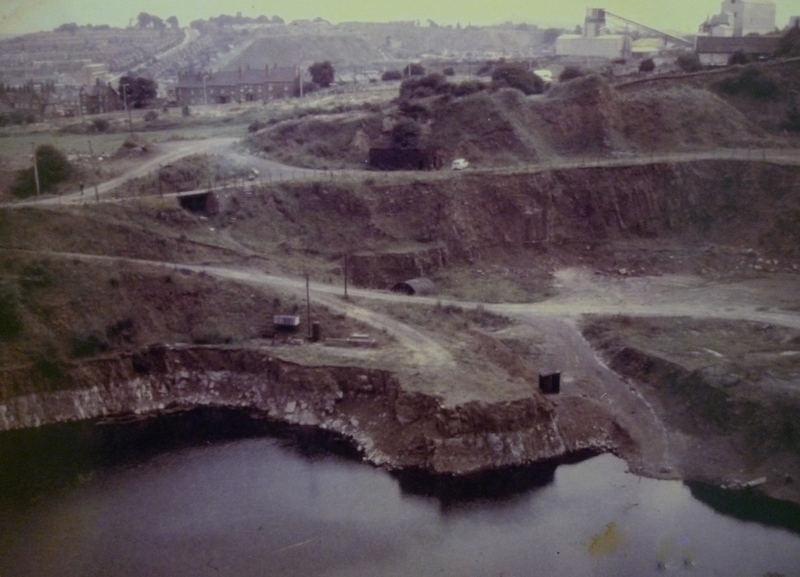 Mining was a very dangerous activity; in 1846 there was a disastrous explosion at the Rounds Green New Colliery on the lower slopes of the Rowley Hills, which killed 19. Click here to read an account of the disaster and the report that was produced subsequently. The photos below show the same views of the Rowley Hills some years ago, compared with the present day. Two were kindly donated by local resident Jim Rippin, who took them when he was a young boy. If you have any old photos of the Rowley Hills, we’d love to hear from you – please get in touch! Edale from Bury Hill Park, 1956 (image © Jim Rippin). Edale from Bury Hill Park, 2015 (image © Mike Poulton). Rounds Green from Bury Hill Park, 1951 (image © Jim Rippin). Rounds Green from Bury Hill Park, 2015 (image © Mike Poulton). The photograph on the cover of this book was taken in the early 1980s from the Rowley Hills (© Heather Angel). The same view as on the cover of ‘In Search of the Wild Asparagus’, taken in 2015 (image © Mike Poulton). This leaflet (produced by Sandwell Council, Dudley Council, The Black Country Geological Society and The Wildlife Trust for Birmingham & the Black Country) gives further information about the history of the Rowley Hills.